Q: On October 13 on Fox News, Brit Hume cited a variation of a supposed Churchill remark: “Americans can always be trusted to do the right thing, once all other possibilities have been exhausted.” It is not really very complimentary to Americans. I thought it was unChurchill-like. Did he actually say it? —R.M., via email. Churchill was not an uncritical lover. Though his best-known early criticism of Americans was “toilet paper too thin, newspapers too fat!,” he had harsh words (almost always in private) for certain U.S. institutions and leaders. A prominent historian recently asserted that Churchill “could never quite make up his mind whether America was Britain’s friend or Britain’s enemy,” which is an unfounded claim. To understand Churchill is to appreciate and accept his belief in Anglo-American friendship. That never wavered, however often he disagreed with U.S. actions or policies. Churchill was appalled, for example, over President Wilson’s naiveté at the 1919 Versailles peace conference. In the 1920s, he railed over President Coolidge’s insistence that Britain repay every debt from World War I, which had cost Britain fourteen combat deaths for every one American. But during visits in 1929 and 1931, Churchill became impressed with the vastness, energy and potential of what he called his “mother’s land.” He wrote witty articles on his travels, with titles like “What I Saw and Heard in America” and “Land of Corn and Lobsters”, concluding that the potential of Americans was unmatched in the world. 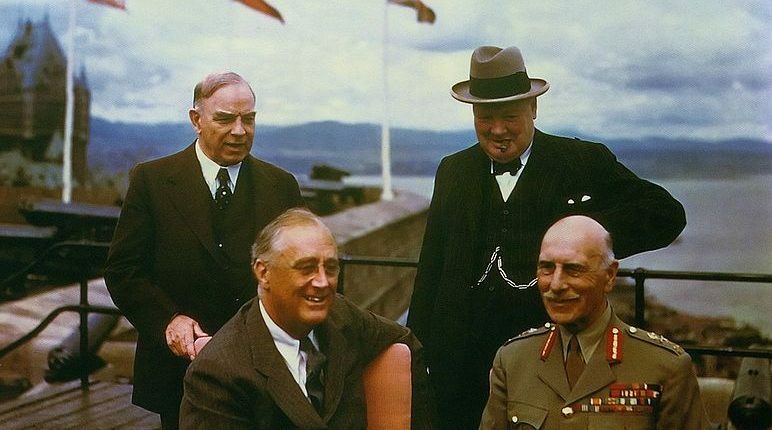 As World War II loomed, Churchill found a natural ally in Franklin Roosevelt, whose New Deal he had criticized in a prewar essay, but whose clear-sightedness regarding Hitler suggested a potential ally. In 1933, long before he and Roosevelt became friends, Churchill entertained James Roosevelt at Chartwell, saying: “I wish to be prime minister and in close and daily communication with the president of the United States.” Churchill then sketched a pound and dollar sign intertwined. “Pray bear this to your father from me,” he told James. Reading The Churchill Documents, particularly during the World War II years, we realize how much Churchill’s faith was put to the test. He chafed over Americans staying out of World War II until attacked at Pearl Harbor. He was depressed over Roosevelt’s apparent “tilt” toward Stalin at the 1943 Teheran Conference. As we proofread Hillsdale’s Churchill volumes on 1943-44, we see the development of their arguments over where to press the attack on Germany. It was a fraught question, and there were good arguments on both sides. In 1946, out of power but not powerless, Churchill was back in America to deliver the “Sinews of Peace” speech, at President Truman’s invitation, in Fulton, Missouri. It heralded the advent of the Cold War. As prime minister again in 1951, the hydrogen bomb now aborning, he worked ceaselessly for an Anglo-American “settlement” with the Soviets. He was frustrated by President Eisenhower, who was adamant that the Russians hadn’t changed. Retired when the Suez Crisis threatened to wreck the relationship in 1956, Churchill wrote sadly to the President: “I do believe, with unfaltering conviction, that the theme of the Anglo-American alliance is more important today than at any time since the war.” His greatest disappointment in old age, after the failure to ensure a lasting peace, was that relations with the Americans had never fully developed as he had wished.